Music has long been regarded as “The Universal Language.” It is the world’s mother tongue, understood by all. The name QWANQWA (literally meaning “language” in Amharic) was chosen for this meaning. 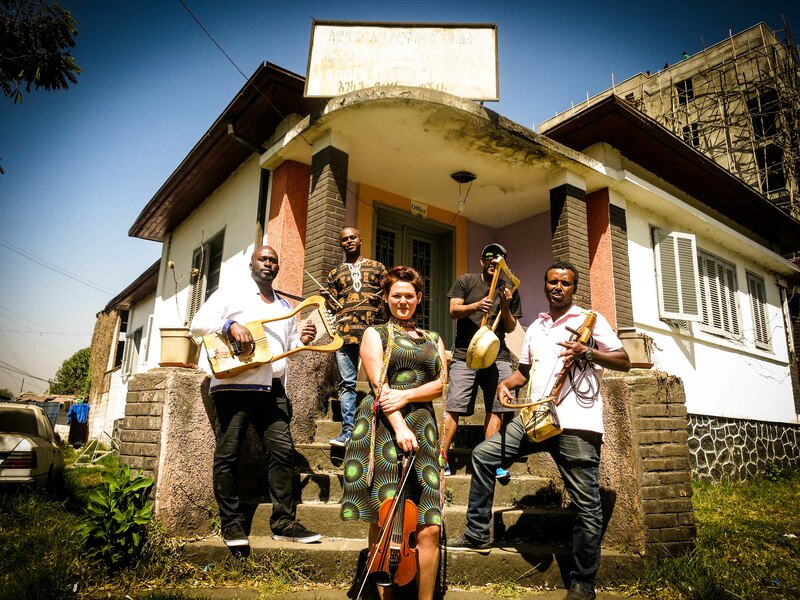 Qwanqwa, based in Addis Ababa, Ethiopia, is comprised of four of the finest Ethiopian traditional instrumentalists, plus Kaethe, who has been living in Addis and working with Ethiopian musicians since she first set foot there in 2009. It’s been called a supergroup of master virtuosos, each of whom is a bearer of tradition, uniquely brought together by a spirit of experimentalism. The group was formed six years ago, and since then has been steadily growing artistically: they have two albums to date, with a third set for release in early 2018, and they perform regularly in Addis. Qwanqwa’s sound is marked by Endris’s swirling masinko melodies, Mesele’s punk krar solos, Kaethe’s wah-violin, and Bubu’s dexterity on the bass-harp, all held together with Misale’s heavy goat-skin drum beats. Mesele has been active in Ethiopian music for over twenty years, releasing original albums and touring internationally, performing Ethiopian traditional music and joining experimental projects with partners like “The EX” and Paal Nilssen-Love. Kaethe first worked in Ethiopian music as a founding member of critically acclaimed Debo Band, and since relocating to Addis, she has participated in numerous exploratory and professional projects, as she honed her sound and immersed herself further into the culture of her surroundings. She maintains an active international performing life, also appearing solo as Ubuntu Rising. Joined by Misale Leggesse on kebero, Anteneh “Bubu” Teklemariam on bass krar, and Endris Hassan on masinko, Qwanqwa’s vision merges a passion for the richness and diversity of Ethiopian musical traditions with a modern sensibility and a desire to expand present boundaries. Members of Qwanqwa have appeared internationally with Getachew Mekuria, Mohammed “Jimmy” Mohammed, Thurston Moore, Nile Project, Fendika, Mulatu Astatke, Addis Acoustic, Mahmoud Ahmed, Fred Frith, Butch Morris, Ethiocolor, Nile Project, Fendika,The EX, Atse Teodros, Imperial Tiger Orchestra, and have played stages from Lincoln Center to Bonnaroo, Jazzfest (New Orleans), Moers Festival, Roskilde, WOMEX, WOMAD and more. 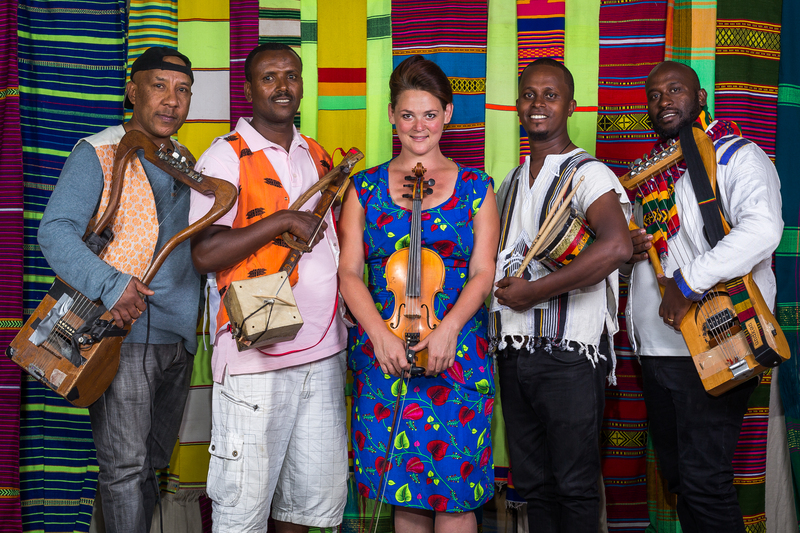 Qwanqwa performs about thirty concerts a year in its hometown of Addis Ababa, and also had a featured performance at Roskilde 2016 (biggest music festival in Northern Europe). Since their founding in 2012, QWANQWA have released two albums: Volume One (2014) and Volume Two (2015). Their third album, Volume Three, produced by Shahzad Ismaily, is set for early 2018 on FPE Records. 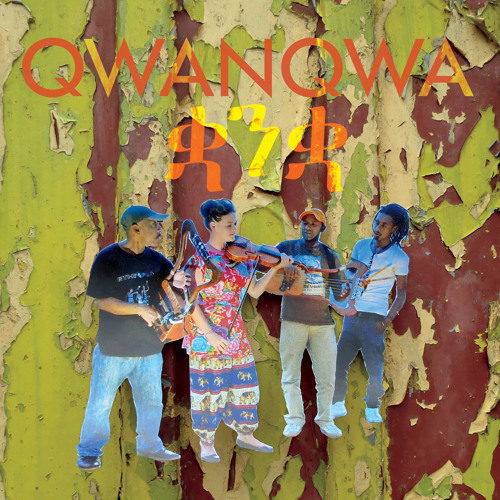 Were Ornette Coleman still with us, I’ve little doubt he would enthusiastically endorse this sophomore effort by Qwanqwa, an instrumental Addis Ababa-based quartet that integrates a number of disparate styles into its bold take on indigenous traditional music. Great concept, great improvising – this is one of the most impressive albums I’ve heard all year. Qwanqwa is for sure is an incredible experimental traditional Ethiopian rock group that deserves to be played in every living room, at every party and on every radio station from Gondar to Santa Cruz.